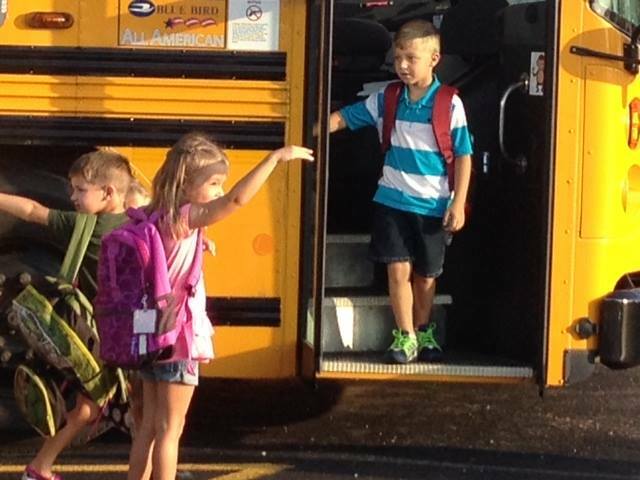 Archbold Area Schools provides transportation for students who reside in the predetermined bus route areas. We take great pride in providing quality transportation. Our bus drivers are highly qualified with an average of 12 years bus driving experience. Our bus drivers get the privilege of being with your child at the start of the school day and the end of the school day and our hope is that we can be a smiling face and a source of encouragement for them to start and end their day. Safety is our top priority when it comes to transporting your child. Our drivers go through extensive trainings to be sure that we are using the most effective practices and procedures to ensure safety. It is imperative that students be at the bus stop in advance of the normal scheduled pickup time. Routes can vary a great deal depending on traffic, late students at bus stops, and weather conditions. In order to keep as close to the schedule as possible, parents need to prepare your children for those time variations. This situation can occur both at the morning pickup and the afternoon drop-off. Children waiting at bus stops tend to wander too close to the roads. Please impress on your child to stay back. When weather conditions are severe, please have plans well formulated and explained to your child on how they are to handle such emergencies. Please help us with advanced plans for your child. Expectations for student behavior on buses are the same as in the classroom. Inappropriate behavior on a bus can be even more of a hazard when that behavior draws the driver’s attention away from the road. We ask for your help and cooperation to instill in your children the extreme nature of this situation. A student who is unwilling to choose appropriate behavior as determined by the driver and building administrator, can and will be removed from the bus. By working together we can ensure that the 2018-2019 school year will be a great success for our students and our school. If you have questions or concerns please contact Linda Schmidt between 10:30 am - 4:30 pm at 567-444-4395.